Today’s reading from the Book of Revelation depicts a strangely beautiful vision of heavenly worship, pointing to the end of history and the Last Judgment. (Revelation 4:1-11). But go back a few chapters, and you find some strong prophetic messages to seven churches, revealing their condition and calling them to deeper repentance, conversion, courage, and perseverance. Those were clearly challenging times for the early Church, and I wonder how they responded to the voice of the Spirit and this vision of Heaven. In my own life, it’s easy to get caught up in what is happening right now, whether it relates to my personal struggles and concerns, or the broader condition of the world and the Church. I can feel powerless and discouraged about my ability to “fix” myself, let alone the brokenness that pervades our world and its institutions. Yet through the power of God’s word transcending time, culture, and life’s circumstances, as 21st century believers, we are also invited to listen to what the Spirit is saying to the churches and enter this vision of Heaven. Yes, we live in difficult times, but we have a sovereign King, enthroned in Heaven who reigns victorious. The battle is already won. He has conquered our darkest night, greatest fears, and most powerful Enemy. As we follow Him closely, like Saint John we are invited through that open door of Heaven. This isn’t just futuristic optimism or poetic symbolism, it is the most real thing we do when we participate in the Eucharistic celebration. This vision of the throne room should evoke in us awe and wonder, and a longing to be with Him for all eternity. Yes, we are full of weakness and failings, but the vision of the twenty-four elders robed in white with gold crowns reminds us of the dignity bestowed on us by Christ, “who loves us and has freed us from our sins by his blood, and has made us to be a kingdom and priests to serve his God and Father.” (Revelation 1:5-6). Yes, we have hardship, suffering, and great trials, but it is always right and just to worship, to give Him praise, honor, and thanksgiving for the wonder of our very existence and for all His creation. Let’s lift our eyes to the One who made Heaven and Earth, and not lose sight of where we are headed, for this life is a breath, a passing shadow. Soon we will be Home. Re-read the first few chapters from Revelation and be comforted by them, even in their wildness. 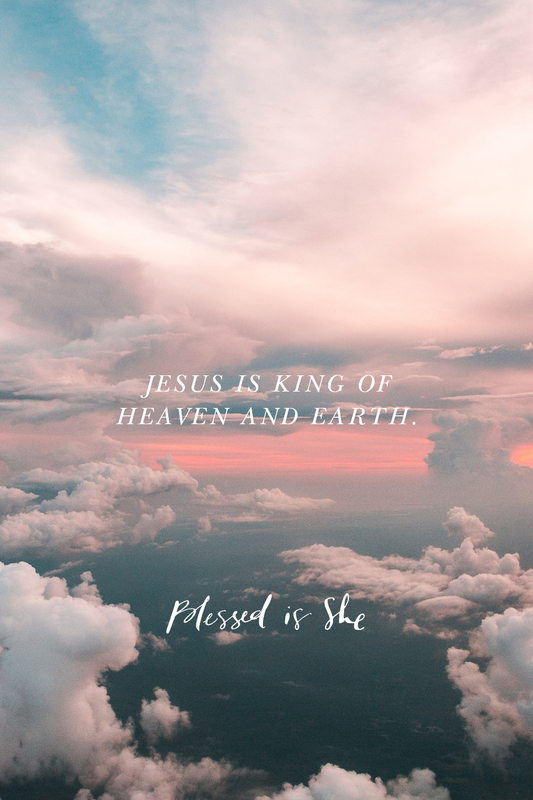 Jesus is King of Heaven and Earth. I look to the Lord and say” My this be the first day of the rest of my live.” Guide my walk though this rocky road and do not abandon me to my sins but give me your grace to move forward to my heavenly home. My God I love have mercy on me.